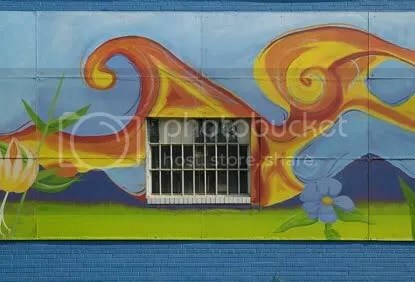 This mural is on the side of a building in the Del Ray neighborhood of Alexandria, Virginia. Del Ray, which has gradually become gentrified without losing its original character and charm, now boasts many ethnic restaurants, small shops and studios, and a thriving arts community. You are currently browsing the blog archives for the day Monday, May 8th, 2006.